I’m sitting in a gigantic Mack truck. Fifty feet away, a huge blimp nearly as long as a football field hovers in front of me, filling up the windshield. There’s a reason why very few people buy super expensive Apple Watches, yet Tag Heuer thinks its brand and heritage will translate into Android Wear sales. YANGON, Myanmar (AP) — Nobel laureate Aung San Suu Kyi’s opposition party on Friday secured a historic majority in Myanmar’s parliament, making it possible for them to form the Southeast Asian country’s first truly civilian government in more than half-a-century. 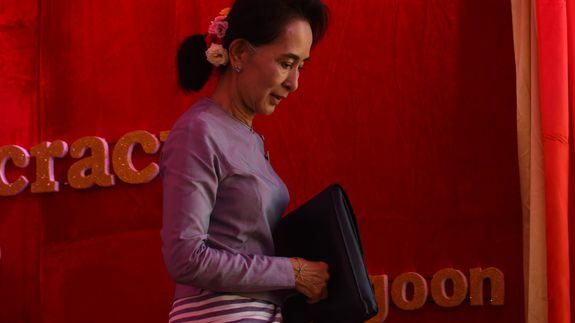 With the tally still being counted, the Election Commission said that Suu Kyi’s National League for Democracy party won 21 additional seats —pushing it over the threshold of 329 seats needed for a majority in the 664-member, two-house Parliament. The 4K display might be something of a luxury for business users who simply want to run Microsoft Office, but the latest top-end 21.5-inch iMac will be an attractive option for users who need a fast and versatile desktop computer. Apple CEO Tim Cook believes that the iPad Pro spells the end of the line for the PC. Xiaomi is the most important phone manufacturer you’ve never heard of. Smartphones serve as the music hub for millions of people and if you commute, work, and play with music then you may be pleased that you have another choice on Android. Apple could be looking at damages of up to $862m, after a jury finds it has violated a patent held by the University of Wisconsin. Freescale aims to be among the first tech players to get its software stack certified for Thread, a mesh network designed for the smart home.